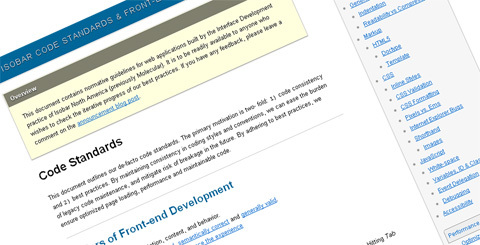 Isobar Code Standards & Front-end Development Best Practices contains normative guidelines for web applications built by the Interface Development practice of Isobar North America (previously Molecular). It is to be readily available to anyone who wishes to check the iterative progress of their best practices. The document outlines their de-facto code standards. The primary motivation is two- fold: 1) code consistency and 2) best practices. By maintaining consistency in coding styles and conventions, they can ease the burden of legacy code maintenance, and mitigate risk of breakage in the future. By adhering to best practices, they ensure optimized page loading, performance and maintainable code. Looks like the Molecular site is up and running but the links to the concerned page is down. Anyone else having troubles accessing the source links? Thanks for pointing to that article.I was looking for something similar for a while and this article conventions are pretty similar to what we already have now. Going to use them for all our future development. Some ideas are really reasonable and useful.